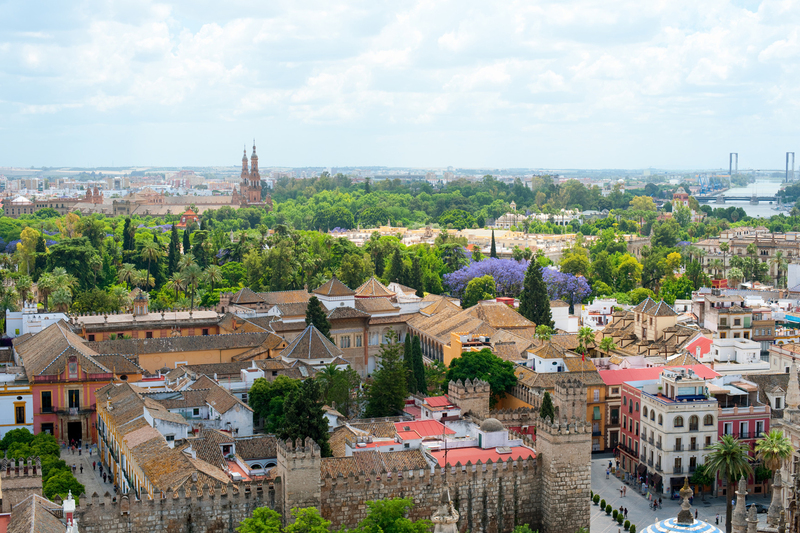 If you have more time on your hands, we can dig deeper into Seville visiting the historical centre of the city and its most well known landmarks. Visit the Reales Alcázares, take a walk around Santa Cruz, stop off at Plaza de España and the Maria Luisa Park. Discover the Cathedral and its Giralda Tower and cross the city centre towards the Guadalquivir River. Visit the outside of the Plaza de Toros, the Torre del Oro and the old Gypsy Quarter of Triana. Total duration: 7 hours ( with 1 hour for lunch). First stop the Reales Alcázares; the oldest Royal Palace in Europe still in use, full of fascinating treasures from a wide range of historical periods, dating back from the Romans to the Moors. Our journey will continue as we enter the narrow streets of the old Jewish Quarter, known today as Santa Cruz and meander along its cobbled streets exploring hidden nooks and crannies. The sheer size of Plaza de España is impressive and you may be surprised to know that scenes from Star Wars were filmed there.This is a splendid area in which to take photos or relax in the nearby romantic Maria Luisa Park inspired by both the Alhambra Palace gardens and the Reales Alcázares of Seville. After lunch we will go on to discover more in Seville’s Cathedral, the biggest Gothic place of worship in the world where Christopher Columbus’ tomb can be found. There we will see the famous bell tower, the Giralda, of which the United States of America have made a few replicas, one of which can be seen in Kansas City. It is the ancient minaret belonging to the 12th Century mosque from which a muezzin would have called Muslims to prayer. On the banks of the River Guadalquivir, hear about the imported merchandise, slaves, seamen and prostitutes of Seville when it was in its prime commercially having conquered new lands in America. We will venture on to take a look at the outside of the Plaza de Toros. You can seize the opportunity to take some spectacular shots from the riverbank near the Torre del Oro, a Moorish tower dating from the 12th Century. If you so desire, at the end of the tour, there will be the opportunity to continue by hiring a boat to take you on a relaxing scenic trip down the river or you may simply wish to receive some further guidance for the rest of your stay in Seville or Andalusia.